The subject is an episode from chapters 5-7 of the book of Esther in the Old Testament. Haman, counciller to the king Ahasuerus, proposed to hang Mordechai for not paying him respect by standing as he entered the room or by greeting him, and the entire Jewish nation as revenge for their pride. The Jews were saved by the intercession of Mordechai's cousin Esther, who was also Ahasuerus' wife. It is this rescue that is still celebrated in the Jewish festival of Purim. In that festival, Haman is portrayed as the villain, and this is reflected in Rembrandt's depiction of him. The dramatic conflict between the three persons is expressed through their restrained but eloquent gestures. The scene has a tense atmosphere of suspense. The figure of Esther is radiant, her robe with a long train is gleaming as if with precious stones. Haman is immersed in the shadows. 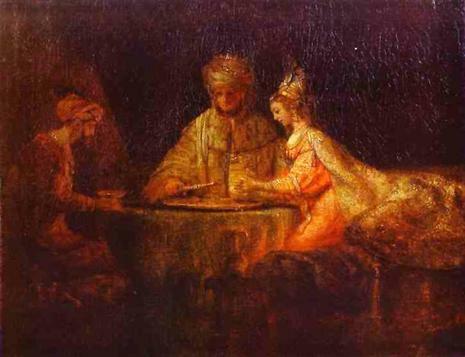 Rembrandt achieves great depth in rendering the inner life, the spiritual energy of his characters.